Double boiled chicken soup with chinese yam and scallops. Chinese yam (Dioscorea polystachya) is called 淮山 or 怀山 (Huáishān) in Mandarin. My mother always boil soup using Chinese yam because it is said to be beneficial to health according to Chinese medicine. 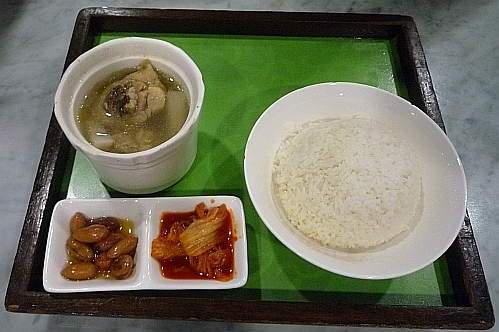 The soup comes with a bowl of plain white rice and two small side dishes - braised peanuts and kimchi for MYR13.40 nett. Good enough for lunch or dinner. So if you go to Tea Garden eatery and don't feel like having nasi lemak you can opt for this soup set. I only know about yam, and didn't know there is Chinese yam...googled for the picture but I still dun have any idea on what it is. Perhaps I should go to Tea Garden and order this to try out what is Chinese yam. I jst went to Tea Garden (in IOI City) during lunch to try out this set. I think the Chinese yam has the crossover texture of yam + daikon. The soup boiled till the yam is too soft and I couldn't get any taste of the Chinese yam. It seems to be tasteless. But the soup is very flavorful of chicken, jst like homecooked soup. Oh, so IOI City has Tea Garden too. Wow, you are fast. The chinese yam flesh is white in colour so it does look like daikon when cut into pieces. It gets soft very easily unlike normal yam so that is why you find it too soft. It does not have any strong taste, more like chinese pear with a finer texture and less sweet when eaten raw. Can go Taiwan eat this Chinese Yam raw. They serve it as a cold appetiser with plum sauce, very tasty. If I find the photo, I will write about it. I'm not into these Chinese healthy soups - will eat if my missus cooks any at home but no, will not go and order and eat it outside. One of my Kuching cousins went to KL with the mum for a few days, stayed at Mid Valley and the mum insisted on going for the herbal soups at Dragon-i for every meal. She was so put off, did not have the chance to go and enjoy everything that is nice and available there. LOL!!! We just treat it as normal soup. Your poor cousin, had no choice but to accompany her mother. If me, I would just watch the mother eat and then go eat somewhere else. I started to develop interest in soup after I met my hubby. Being a Foochow, he loves soups. So I learn to cook some Chinese herb soup etc. Seldom cook Chinese tam. Only have it when dine out and not many Chinese restaurant serve this kind of soup. Oh, Foochow also loves soup, I see. I thought only Cantonese loves soup. No lah. The above set is my spouse's set and he ate all the Chinese yam except for one piece which he gave me. I think i would just do with the Kimchi, i love kimchi so much! Ah, better eat the whole set for a complete meal. Have you cooked chinese yam before? I too would have the soup and the peanuts. Someone else can have the kimchi. You don't like kimchi or you just don't like sour food? Looks good, Mun... I tried their herbal chicken before, not bad too.. I have yet to try their herbal chicken. May try next time. Chinese Yam tastes good, right? Weekend is here soon, have a good weekend! Cannot la... this is too (plain and healthy compared to nasi lemak. Nasi lemak still win for me haha. Got kimchi to go with the soup so won't be too plain tasting. Hahaha so you will still stick with nasi lemak.